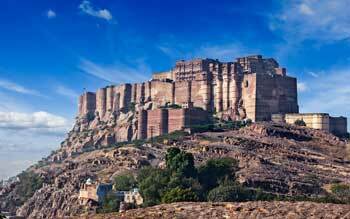 One of the largest forts in India, the Mehrangarh Fort, locatedat Jodhpur was built in 1460 by Rao Jodha. This Fort holds the Pride of Jodhpur with its rich history and beautiful style of architecture. There are 7 gates in the Fort and each of these gates were built by different rulers in order to celebrate the victory over the Jaipur and Bikaner armies. The Fort houses several magnificent palaces such as Phool Mahal, Moti Mahal, Zenana Dude, Jhanki Mahal and Sheesh Mahal. The fort also is home to Mehrangarh Museum which has many different galleries that showcase different types of artifacts and artworks like Palanquins, Elephant’s Howdahs, Daulat Khana, Paintings, Armory and the Turban Gallery. The Mehrangarh Fort situated at the top of the hills looks down at Jodhpur protectively. Welded Tuff, Bluecity Walks and Loha Pol. October to March is a perfect time to visit Mehrangarh Fort. By air :The nearest airport if the Jodhpur airport which is a domestic one and can be reached from other cities in India easily. By train :The Jodhpur railway station is at a distance of 3 kilometers from the Fort. By road :Jodhpur is easily connected by road to all other major cities and bus and taxi servces can be hired esily.